Australia’s solar industry had a sterling year in 2012, during which nearly half the nation’s cumulative solar panel capacity (currently about 2.6 gigawatts) was installed, according to the Australian Photovoltaic Association (APVA). 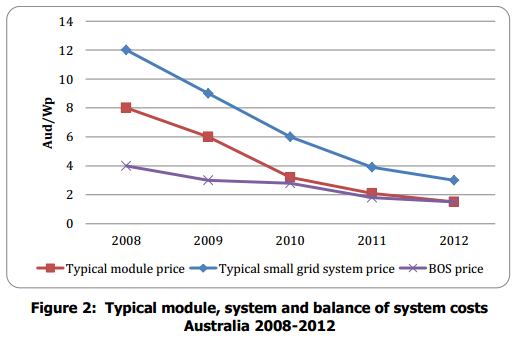 The report, PV in Australia 2012, also reveals that the country’s solar sector employed about 11,000 people (mainly in installation & maintenance), and reaffirms that the average price of installing a solar PV system has come down even lower than 2011 prices. In total, 1.038 gigawatts (GW) of solar PV capacity were installed in 2012–more than any previous year, including the ‘boom’ years of 2010 and 2011. The vast majority of this–1.008GW or about 98% of the total–was from distributed systems across the grid (i.e. small- to medium-scale rooftop PV systems), contributing hugely to Australia’s surpassing the ‘1 million solar homes‘ milestone earlier this year. The remaining 30 megawatts (MW) was split between off-grid residential (about 10MW), off-grid non-residential (about 6MW), and utility-scale, grid-connected solar power plants (about 14MW). Altogether, solar PV accounted for 4.5% of Australia’s total energy generation capacity and 70% of the new capacity installed in 2012. The dominance of rooftop solar in the numbers highlights the swift rise to popularity that the technology has seen in Australia in recent years, initially spurred on by generous state and federal incentives for renewable energy. A significant portion of the 1.008GW of rooftop solar installed during the course of the year can be attributed to rushes in the run-up towards deadlines to apply for state-based feed-in tariff incentives such as Queensland‘s Solar Bonus Scheme, and Victoria‘s and South Australia‘s respective solar feed-in tariffs. Nevertheless, according to numbers from solar consultants SunWiz, 2012 installation numbers remained steady even in states where state government support for solar was no longer available for new system owners–namely, Western Australia and New South Wales. The APVA report also reveals that the solar industry employed a significant number of people across the nation–around 11,000. 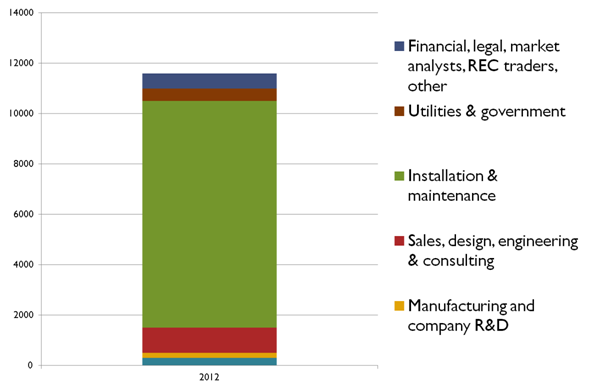 Although the majority of those involved in the solar industry were installers, many were also found to be working in other sectors, including technology research & development (R&D), government positions, finance, and sales. This information will doubtless be of interest to renewable energy advocacy groups such as 100% Renewable Energy–not to mention the politicians who they petition. One of the most important factors behind the success of solar PV in Australia is its increasing affordability, which has enabled it to keep up with ever-rescinding levels of government support. The APVA has found that the cost of installing a solar PV system continued to fall between 2011-2012, albeit not to the same degree that had been seen in the few years prior. The average, the unsubsidised cost per watt ($/W) of installing a system in 2012 was around $3 in the year 2012, vs about $3.90 in 2011. The fall is due mainly to reduced solar module and ‘balance of system’ (BoS) component costs. 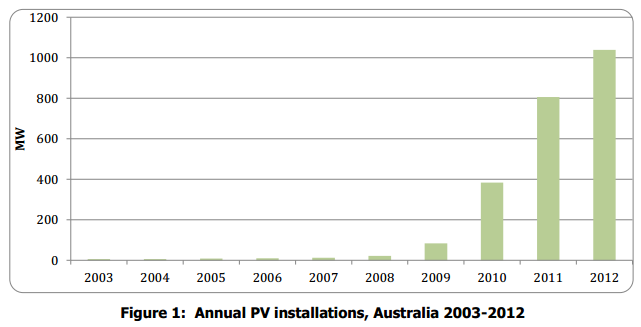 Solar Choice’s own solar PV system installation data more or less corroborate the APVA’s 2012 numbers–particularly with regard to 1.5kW and 2kW solar PV systems, whose installation costs have remained more or less unchanged since 2012. According to Solar Choice’s most recent Solar PV Price Index (July 2013), however, larger residential systems (3kW, 4kW, 5kW) have continued to decline, with average 5kW system prices currently around $1.75/W, fully installed. Even larger commercial systems–10kW, 20kW, and beyond–benefit from economies of scale and have still lower $/W installation costs.